Looking for a lightweight powerhouse to assist with harvest duties? Then a secondhand JD 7530 could be a shrewd investment for the canny buyer. Geoff Ashcroft reports. 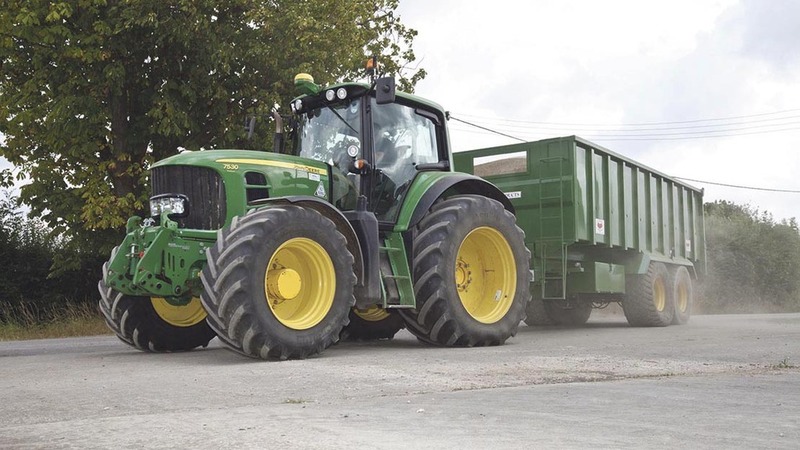 With plenty of power in a light body, a second-hand JD7530 could prove a cost effective versatile tractor. John Deere’s 7530 tractor was introduced in 2006, to extend the upper reaches of the 6000-series full frame tractor range into the 200hp bracket. The Mannheim-built 7530, and the less powerful and lesser-spotted 7430, bridged a gap between the popular JD6930 and new Waterloo-built 7730, 7830 and 7930 tractors, which replaced 8.1-litre 7020-series models. And with average tractor power creeping ever higher, the appeal of a secondhand lightweight 180-200hp tractor cannot be over-looked. Importantly, the 7530 offered a power to weight ratio of 30kg/hp, and with its elongated wheelbase and tougher rear-end from the 7010-series, it had the ability to wear 42in tyres and pack a 385-litre fuel tank. At last, Deere had a lightweight, high-power offering which could meet demand for a variety of field and transport duties. Available in Premium and standard cab variant - most UK models were Premium - the 7530 was like others in the range, updated in 2010 to meet Stage 3b emissions regulations. Software and subtle engine design changes were claimed to push power up by about 5hp, while fuel consumption was reduced by 2-3 per cent, helping to extend the model’s longevity until 7R models eventually took over. A 7530 E Premium version appeared in 2009, and offered 20kW of electrical power for external use. If you find one, the odds of you stumbling across a pot of gold at the end of a rainbow could be greatly reduced. As found in the six-cylinder 6030 models, the 7530 uses the same 6.8-litre PowerTech Plus engine with variable geometry turbo, cooled EGR and high pressure common rail fuel injection to meet Stage 3a emissions. Rated power is 180hp, but in Premium guise, Intelligent Power Management lifts output to 203hp. The PowerTech Plus 6068 engine has though, been hampered by head gasket failures. Most were rectified early on by Deere under warranty. Supporting evidence of a correct repair will bring piece of mind when buying used – if in doubt, get the serial numbers checked. And if the head gasket has never been done, there is the likelihood that you may need to factor in an eventual repair. Inconsistent fuel quality has also been known to cause issues with fuel injectors, particularly among earlier models. 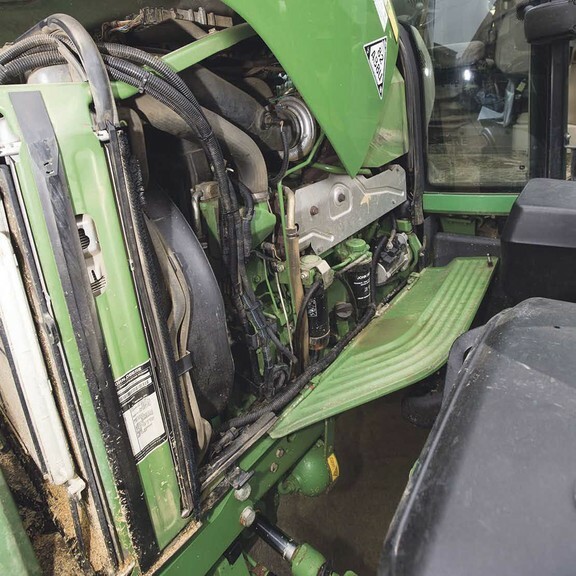 It is likely that few tractors will have been refilled from a finely filtered fuel supply – typically 10 microns – and most are likely to have had, or may soon need, injectors replacing. Similarly, the EGR valve, inlet manifold pressure sensor and variable geometry turbo are areas for concern - the latter on those not working hard enough or frequently enough, could soon create a big bill. Depending on how you like your cab - with or without side-opening windows for fresh air - Deere had all bases covered with the 7530. 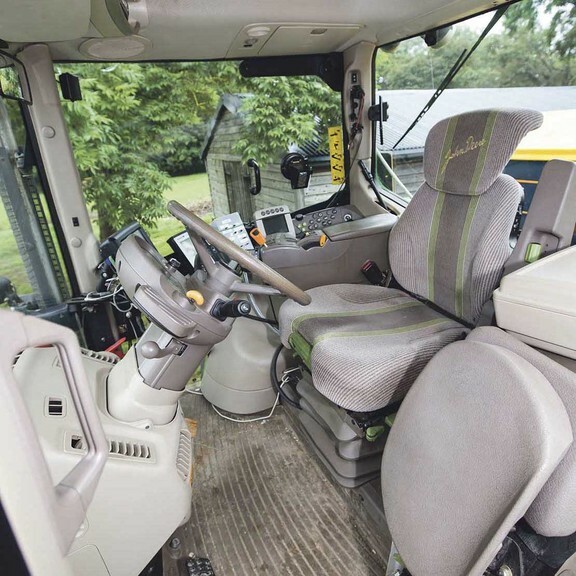 Its cab could be specified with standard doors and side-opening windows or panoramic doors on both sides - the latter altering the cab to a four-post design for those who preferred a wide expanse of glass. Like smaller 30-series tractors, the ‘seven-five’ gets a contoured bonnet giving a narrower look and feel. Optional Xenon work lights provide enhanced visibility at night and the cab is rated at 70.6dBA – at the time, it was claimed to be the quietest on the market, in its class. Some buyers might find a few models fitted with an optional hydraulic cab suspension (HCS) system too. A leather seat and steering wheel were also on the options list, though most seats were standard cloth. The left hand shuttle reverser is integrated into the steering column, just like the windscreen wiper lever and the direction indicator – the latter is self-cancelling. A one piece, right hand console incorporates the most often used controls and buyers had a choice of mechanical or electrical selective control valves for hydraulic functions. Deere’s CommandCenter on the 7530 Premium-spec tractor is a combination of information centre and set-up monitor in full colour display. It also allowed operators to choose from three modes for the standard fit TLS Plus advanced front axle suspension system. Using Auto, Max or Manual modes, the system automatically produces a progressive spring adjustment to provide the best ride quality under extreme conditions. Transmission options include PowrQuad Plus 20/20 (40kph only), AutoQuad Plus 20/20 on 40 and 50kph, and AutoQuad Plus Eco Shift - the latter providing a 40kph road speed at reduced engine revs. AutoPowr CVT was also on the list and offered either 40 or 50kph road speeds. Boxes are reputed to be trouble-free, as long as oil change intervals have been adhered to. All 50k tractors were accompanied by air brake systems and it is the 50kph variants which are most likely to see braking issues. 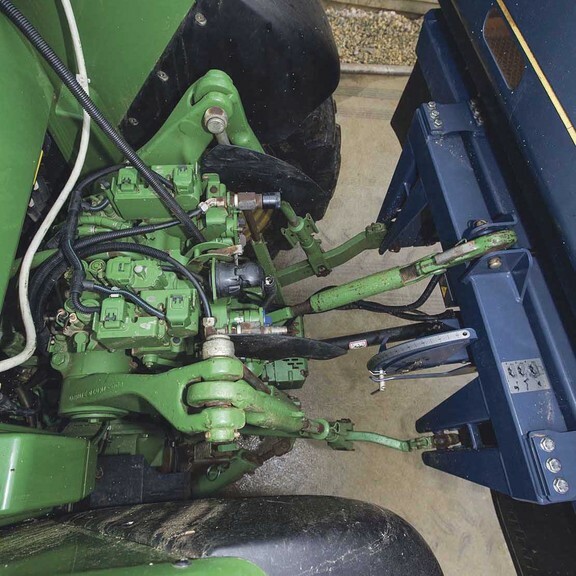 Although 50kph tractors enjoyed four-wheel braking, problems could often be narrowed down to poor trailer brakes which placed a higher dependency on the tractor’s oil-immersed brakes. As a result, brakes should be inspected every 3,000 hours to assess condition, so look for service history or receipts to show any work which might have been carried out. A Cat III rear linkage with nine-tonnes lift capacity is standard, and up to four SCV’s could be fitted along with a maximum flow of 110-litres/minute. Rear PTO includes 540E/1000/1000E speeds. As with any secondhand purchase, a thorough inspection and test should reveal any pending faults, leaks and gliches. And overall condition of course, is everything. 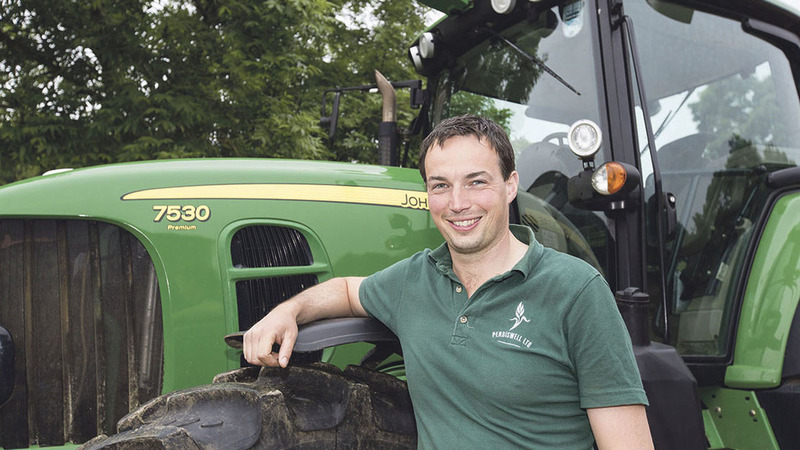 Oxfordshire grower James Price of Perdiswell Farm, Woodstock, bought a JD7530 with 50k AutoPowr box, to add to the fleet. But it has not been plain sailing for the eight-year old tractor that has just 4,500 hours under its belt.